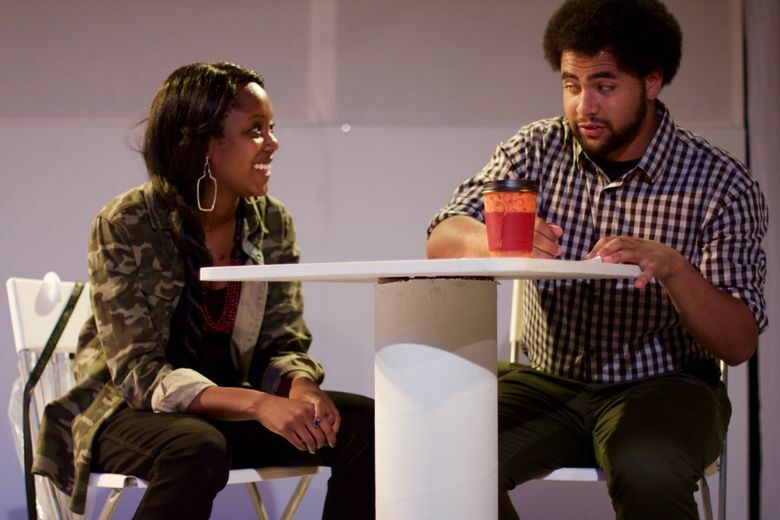 A review of Benjamin Benne’s new play, “Terra Incognita,” making its debut at Annex Theatre in Seattle. If there’s a difference between memory and nightmare, it’s mostly imperceptible in “Terra Incognita,” a new play by Benjamin Benne premiering at Annex Theatre. Loss, regret and longing take many forms in Benne’s play, which is emotionally astute but rudderless, drifting between fairly naturalistic conversations and supernatural bouts of existential dread that drip with metaphorical significance. Nadia (Lillian Afful-Straton), a recovering alcoholic on the road back to normalcy, sees metaphors everywhere she goes, whether it’s a sinister crow that seems to be stalking her or the name of her dead boyfriend branded on her arm. She’s still consumed by the man, who died two years before in a drunken car accident, and forces seem to be willing her to step backward into her own damaged past. by Benjamin Benne. Through Aug. 20, at Annex Theatre, 1100 E. Pike St., Seattle; $5-$20 (206-728-0933 or annextheatre.org). Trying to guide Nadia to some sense of renewal is Sheila (Gretchen Douma), an empathetic social worker who encourages her to breathe out all the “old air” still stuck in her lungs. The first act is largely devoted to concurrent scenes of Nadia’s therapy sessions with Sheila, and while this is a limited dramatic construct, the pair’s gradually built rapport feels real under Pilar O’Connell’s patient direction. Afful-Straton, all uncomfortable fidgeting and sharp edges, brings Nadia’s wariness right to the surface, though her performance doesn’t deepen much past that initial defensiveness. It’s not difficult to anticipate what will happen with Sheila, the social worker with the requisite personal problem that corresponds neatly with her patient’s, but the way Douma’s performance opens up from no-nonsense forthrightness to delicate introspection is lovely. Still, Benne’s script doesn’t quite convincingly position Nadia and Sheila as analogues; it’s far more devoted to exploring Nadia’s grief than Sheila’s, which seems tacked on as an afterthought. For Nadia, her obsession with the past presents a very real danger to her present, but despite some effectively unnerving lighting and sound design from Ranleigh Starling and Chris Leher, Nadia’s nightmares never spark. For all its mystical flourishes — including a winged creature who might be an angel or could be that menacing crow (Eva Estrada Campos) — “Terra Incognita” is on its most solid footing when it’s exploring the importance of the mundane to emotional recovery. Sheila repeatedly asks Nadia to identify one small pleasure in her daily routine, and that advice becomes central to Sheila’s own well-being as well. And though they’re intermittent, “Terra Incognita” possesses a number of small pleasures of its own.